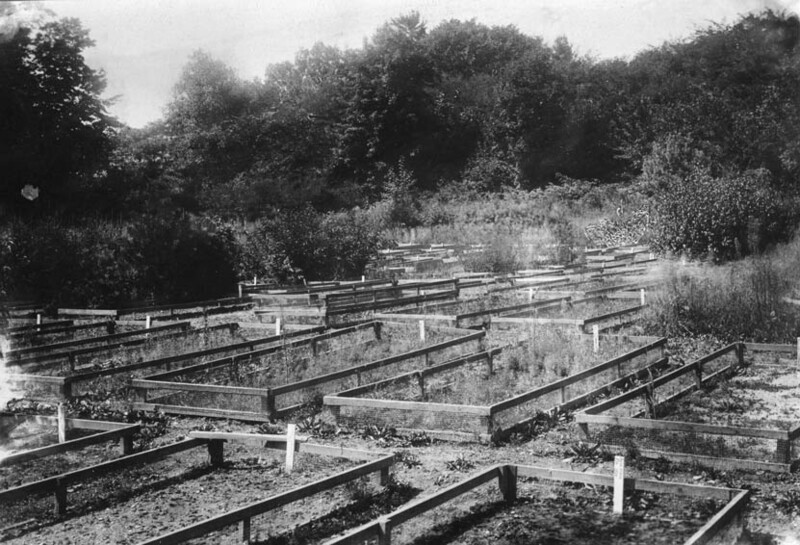 View of seedling beds in the plant nursery in Letchworth Park located near what is now the maintenance area in the south end of the park. The small areas with fence around are typical of the method of nurturing seedlings from the time they are planted as seed. The plants would be crowded into these beds and checked for numbers that germinate. This would also allow for weeding of the beds and for those species that require some shade the fence would allow for covers to protect the plants to be laid across the rails. Not clear in the photo is the presence or absence of fence wire to keep out rodents. Bunnies were a problem at times for nurserymen and gardeners alike. 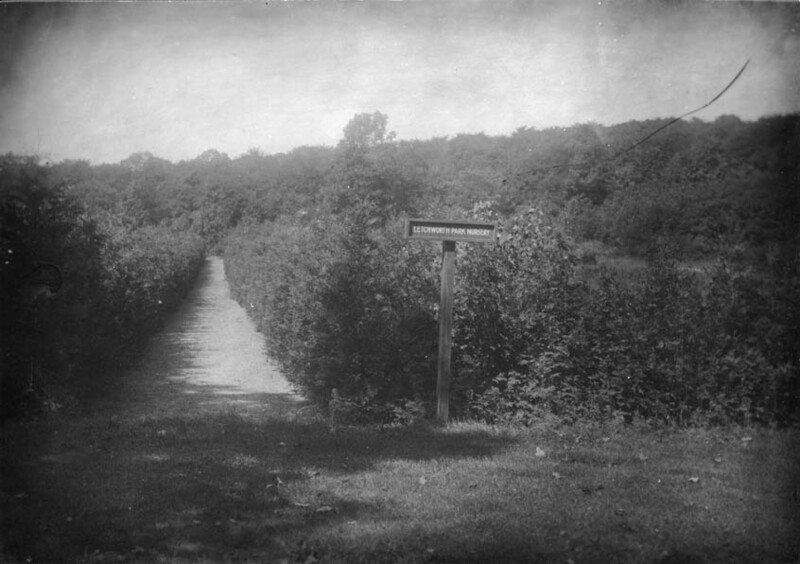 Trees or shrubs lined out in rows in the area marked by the sign reading "Letchworth Park Nursery" This probably helped the tourists understand why there were such crowded rows. Known nursery locations were near the present maintenance area and the CCC one in the Lower Falls area behind the South Pool. Trees and or shrubs shown were possibly grown from seed in the nursery beds. Park records exist showing seed purchases even from foreign countries Usually when the trees in the beds reached a foot or so tall they would be lined out as in the picture until they had grown to the size shown when they would be ready to plant at the location where desired to grow permanently. Many of the trees grown in the nursery beds can be found today in the arboretum blocks along the main park road south of the Visitors Center. 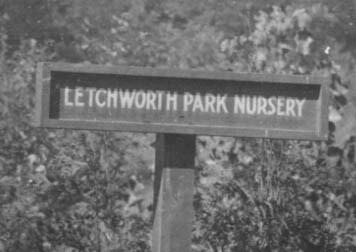 Some early experiments with growing hardwood species were done in Letchworth. For example ash, tulip poplar, red oak, catalpa, and honey locust were some of them and they still exist in the arboretum. For more information see our Glimpse on the Arboretum in Letchworth Park. We thank Letchworth State Park for allowing us to use this photographs from their archives!